Summary – Yesterday we got more great news about the economy: there are more openings than unemployed. It is fake but exciting clickbait. This is “we are ignorant because we read the news,” chapter one million. Very exciting news! Great news about the economy! Let the self-righteousness flow at the thought of all those open jobs unfilled while lazy people watch TV. It is a simple story, visible in one graph (click to enlarge these graphs). Purple is the number of job openings; red is the number of unemployed. The two were almost equal in January 2001. The number of job openings comes from the Job Openings and Labor Turnover Survey of employers conducted by the Bureau of Labor Statistics. An employee quitting is an actual event, as is hiring and firing an employee. All have consequences. But what does it cost to electronically post a job opening – one with high requirements and low pay? Nothing. Employers have become creative in playing the job market. During the history of the survey, there were always more hires than openings – until August 2014. Now there are more openings than hires. More openings than hires every month, while the growth rate in real wages slows. So which signal tells the truth? Trust the one which reflects real money in motion: wages. When there are widespread skill shortages, real wages will rise. These are all stories of employers who have rigged the game. Workers pay for their own training. Employers demand much and give little. Especially note the descriptions of pilots and truckers jobs: expensive training, hard work, long hours, employers complaining about shortages of workers – but no big pay increases. Heather Long at the WaPo debunked the simple skills shortage story in “America has a massive truck driver shortage. Here’s why few want an $80,000 job.” In an earlier story, she shows how trucking firms are raising wages – and raising their prices much faster. See the April JOLTS survey report and the BLS’ Highlights report. Nike swooshes us into a future of fewer jobs, low pay. this is an example of why both parties support open borders. Cheap labor for the right, voters for the left. I do remember Obama trying to stop Mexican truckers from entering the U.S. due to the lack of safety inspections on Mexican trucks and their willingness to work for peanuts delivering NAFTA goods. Haven’t seen any follow up articles on where Mexican truckers can go in the US. But as long as we continue to allow a steady stream of immigrants illegal and otherwise into our country, wages will continue to be flat. There is a positive side for consumers though. This keeps prices lower. It would be interesting to see how many truckers are recent immigrants. Yes, that explanation nails it. Immigration has many economic effects. As you note, depressing wages in affected jobs. And boosting aggregate GDP. It’s net effect on individual households depends on how its workers’ wages are affected! Another factor, almost never mentioned: immigrants increase population, requiring construction of more public infrastructure (eg, roads, schools) and hiring more govt workers. But our mostly low-skill immigrants do not generate the taxes needed to pay for these. So their weaken the finances of States and localities with high numbers of them. Like California. For some answers, see these. “Immigrant truck drivers: Shhhh. We don’t talk about it.” at FlooetOwner — “Yet recruiting immigrants to be drivers appears to be a successful tactic, despite trucking’s reluctance to discuss it. “America’s trucking industry faces a shortage. Meet the immigrants helping fill the gap.” at Public Radio International (funded by good liberals). Immigrants are helping to keep truckers’ wages low! “Immigrants Making an Impact in the Trucking Industry” at the website of Joshua Goldstein (immigration attorney, one of the groups directly benefiting from open borders), 17 July 2017. Here is a detailed report, but old: “Who’s Behind the Wheel? Immigrants Filling the Labor Shortage in the U.S. Trucking Industry” by Zahra Sohail Khan at the George Mason Institute for Immigration Research, December 2014. The Institute might have published more current info. Larry, check graph at beginning. I believe you mean purple=unemployed and red=employed. All those articles about the lack of STEM skilled employees seem disingenuous to me. I have a BS in Electrical Engineering and a recent Associate in Technical Arts – Robotics and Electronics Tech certificate (3.96GPA! ), and yet I’ve applied to literally dozens of robotics and electronics technical positions with never a response beyond “Thanks for your resume…”. It’s like the job openings are not intended to actually acquire new employees. Is this all a game to increase the quota of H1B visas? I have no animosity towards Indian tech’s, I’ve always enjoyed them as peers. However, they are willing to work brutal hours for very low wages, and employers are taking advantage of them. I seem to have some skill as a financial trader, so we’re doing fine. Guess I’ll stay self employed. That’s a brilliant observation. To get the H1Bs, corps have to demonstrate scarcity. I’ll look around for articles about that. Anecdote is not data, but I can tell you that where I work we’re pretty shorthanded. But that’s because HR never hires anyone who actually applies. They post the job and people apply. Then HR sits on it until a.) The applicant takes a different job, because they have a family to feed, or b.) The applicant gets a better offer somewhere else. So while in theory we have openings, in practice we aren’t hiring. Make of that what you will. I don;t how widespread this sort of thing is. The training budget has been cut to nothing, and the last few hires we actually got have had God’s own job getting any gas money when they have to go drive somewhere to take a class or get certified. Training at this point is a sham. This sort of thing was unheard of when I was starting out those many years ago. You are describing how profits are kept high by burning the future. It’s a common practice in America these days, in both govt and business. We see it in government, with the collapse of non-military infrastructure spending. Which is made much worse by the graft that inflates the cost of what we buy by 2x. or 3x. Or more. An old friend of mine who used to work as a welding inspector said more or less the same thing. The company he worked for went out of business and for a long time he kept up his certs because he was sure that infrastructure spending would pick up. Bridges getting old, and all. But he ended up in sales. One of his jobs got ended because the company was looted by corporate criminals. Most employees were owed money when the place showed down. he actually got paid because he made it clear that he had kept copies of certain emails, and he was one of the few paid in full. It’s actually come to that. The other thing I see is people touting a good economy on account of a good stock market, but the two are not equal and coordinate. I keep wondering if we’re in Dutch tulip territory. There is at most a weak correlation between economic indicators (eg, GDP, jobs) and stock market prices. That’s a common worry. I believe something different has happened to bring valuations to these levels, for so long — with so many highly valued but unprofitable companies. My guess (guess!) is that the market structure has changed. A large fraction of daily volume is done by machines running algorhythms. At some point these may have the market operating differently than when people made the decisions. For a simple and small example: the prices on used books at Amazon are largely set by the retailers algos. In the early days they used simple rules. Such as prices at a dime more than the average (“since we’re better”). If there were two or three vendors for a book, and two used this rule — prices would relentlessly climb. I’d see pulp westerns or sci fit selling for hundreds or thousands of dollars. Now they use more sophisticated algos, and prices are reasonable. The algos trading stocks are vastly more sophisticated, run by hundreds of firms around the world. Perhaps their interaction has produced unanticipated strange results. Like we see today. When ever I see worry about stocks, I try to remember Random-Walk-Down-Wall-Street by Malkiel . As long as most Americans are investing through 401K etc, it could be a bubble. But likewise, with all the retirement and persons with 401K type diversified accounts, I think it will be a slow fall, more so than a tulip bubble. Too much money and vested interests involved. But the caution is that such beliefs for at least two recent occasions, housing and dotcom, did not stop large market adjustments. Slow declines are the usual prediction in times of high valuations. They almost never happen. People start to sell – for whatever reason – which sparks a rush for the door. Supply – demand balances tilt from sellers scarcity to buyers scarcity in a heartbeat. None of that makes a dimes difference. There’s one more alternative, which happened in the 1970s. Dollar prices can stay range bound for an extended period while inflation whittles away the real value of equities and brings PE ratios back toward the mean. The great 1973-74 crash brought stock valuations back to average levels. Also, inflation has little effect on stock valuation metrics. False. First, price to earnings ratios are a ratio of two nominal numbers, and unaffected by inflation. That is, they are unchanged if expressed in real terms. Second, profits (and hence pe ratios) were increased by inflation in the 1970s due to use of first-in-first-out accounting (FIFO), which produced phantom inventory profits. Hence many companies, esp those heavily affected by this, also showed profits by last-in-first-out (LIFO) accounting. Nominal values remained in a range from 70 to 75. Real values remained range bound throughout the decade. Please read what I said more closely: “The great 1973-74 crash brought stock valuations back to average levels.” The SP500 PE was 18 in 1969. it collapsed to 8 in 1974, and never recovered to the 1969 level until 1987. 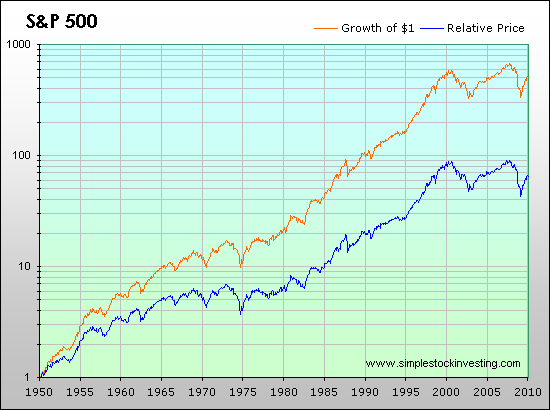 The nominal level of the SP500 matters not at all from a valuation perspective. I don’t know what your point was in showing it. Your statement about inflation and stock prices & PEs was wrong. Admit it and move on. I don’t agree. The 74 crash brought valuation down to 8x very dramatically, but temporarily, just as the 2008-2009 crash did. The market quickly recovered to about 12x (close to the historic mean) in less than a year. From then PE valuations drifted back down to as low as 7 before finally breaking out convincingly and sparking the great bull market of the 80s and 90s in the fall of 1982. Even as the valuation multiples languished, however, the nominal value of the market began to climb. Inflation masked an eight year period of of real value consolidation as earnings caught up with stock valuations. That period worked off the excesses of the prior bull and built the base for the later boom. While there will certainly be one or more severe contractions to correct what currently appear to be valuation excesses, a rapid reaccelerating of inflation could significantly mask the depth of the correction in terms of nominal prices. Past history shows that most periods of excessive debt have been worked off through inflation rather than financial collapse https://www.amazon.com/This-Time-Different-Centuries-2009-10-01/dp/B01MQZYLBX/ref=sr_1_2?s=books&ie=UTF8&qid=1528502958&sr=1-2&keywords=this+time+is+different+reinhart+rogoff&dpID=41xM8gvm%252BnL&preST=_SY291_BO1,204,203,200_QL40_&dpSrc=srch My belief is that the same will happen with the current global debt bubble. A bear market in valuation multiples, if not in nominal equity valuations, would be a logical corollary. The period when this would presumably happen will coincide with the maximum drawdown of Baby Boomer savings, creating significant pressure for a valuation bear market, but the inflation will mask the nominal impact. Whatever, I see you are hopeless. Yes, that’s what most commenters do when proven wrong: shift the subject. Whatever, dude. I actually responded on nominal price versus real equity valuation, which was my point from the start. I added what I believe will be the trigger of the expected real value correction as well as the nominal price inflation. You didn’t respond to my further analysis of the 1970s. I’ll stand pat. We’ll agree to disagree on this one as neither of us is likely to budge. Since you changed the subject (from stock valuations to macroecon effects of debt), I put this in a second comment. I haven’t read the great Reinhardt-Rogoff book, but I’d like to see where they say such a thing. It was certainly not true in 19thC Britain, where they had periods of high public debt and periods of high private debt — none of which were worked off with either inflation or financial collapse (although they had the booms and busts inherent to free market systems). Nor in the US, where the massive Civil War debt was worked off with neither inflation nor collapse (that is, the legitimate govt’s debt; the Confederacy insurgency defaulted). The period of most massive private debt (relative to the economy) until our time was the 1920s. It was worked off with collapse AND deflation. No inflation. I recommend reading “How Short-Term And Long-Term Debt Cycles Work“. It’s a good intro. You’ll learn much from it. Here is their relevant graph. Rheinhardt and Rogoff track a large number of debt cycles in 66 countries over eight centuries. I don’t have access to the book right now as I am on a plane, but they clearly showed in a majority of the cases that debt overhangs were more likely to be worked off with inflation than through deflationary collapse. You don’t have to go further than Britain. The 19th century was an anomaly as the pound was on the gold standard. Over 800 years numerous monarchs chose to inflate (debase) away debt rather than pay it off in real terms. The western world enjoyed significant real growth throughout most of the period, which made it far easier for debts such as the U.S. Civil War obligations to be paid in real dollars. In a more recent example post empire Britain sustained a great deal of inflation as it addressed its WWII debt. The pound declined from more than $5 U.S. to $1.33 while the value of the dollar declined 90%. We’ve been witnessing the phenomenon of inflating away government debt in the western world as the real rate of interest paid to risk free investors has been significantly negative for an extended period. Perhaps that’s changing with the recent rise in rates, but I doubt it. Modern governments do not have the fortitude to accept financial pain without further inflating the currency. I looking through my files and found their famous paper announcing their results in the American Economic Review, May 2010. Their emerging market data is largely from the 20th century, due to data limitations. Before that “emerging markets” were unable to borrow except in hard currencies (i.e., someone else’s currency) or gold. Inflation was not an option for them. Default and depression were the only choices. What’s different today in the advanced markets is that their currencies have become increasingly tethered from any connection to reserve requirements, making them much more like the lesser developed economies that experienced excessive inflation rates in the past century after their currencies became untethered. The connection to hard metals in the western economies was severed in the 1960s and 1970s. That led to a 665% inflation in the U.S. since January 1, 1970 according to BLS, which likely understates the real inflation over the period for most Americans. More recently the Federal Reserve and other central banks have found increasingly ingenious methods to monetize credit creation, so far without sparking the levels of inflation we saw in the 1970s. Time will tell whether they are successful long term. I’ve tried hard to understand how we could have accomplished the level of money creation we have without more inflation. The primary answers seem to be a break in the credit creation mechanisms of fractional reserve banking and the role of the dollar as the global reserve currency, which provides an escape valve and has helped support the deflationary impacts of globalization. We’ll soon see what impact the trade war has on this dynamic. What the central banks have accomplished is interest rates on savings below the level of inflation, which is the phenomenon I expect will eventually work off the debt overhang. That’s the optimistic view. The pessimistic version is that the overhang of debt will need to be monetized very quickly to avoid deflationary collapse, leading to a jump in inflation rates in the teens or higher. It’s happened before. The counter to this is rapid automation of production, but that potentially poses another set of problems on the consumption side of the equation and may lead to a guaranteed minimum income to offset its effects. As I’ve said before, that’s because you know nothing about economics. That is, much of what you believe is false – offsetting what you know that is correct. So explanations to you are wasted. Buy an Economics 101 text. Or take an online course, or one at your local community college. I understand that some folks don’t believe that a Princeton economics degree is meaningful due to the Keynesian slant of the program. However, I will put some of my profs (Burton Malkiel, William Bowen, Arthur Lewis and William Baumol) in the top ranks of those who formed much of 20th century economic thought. Admittedly only my thesis advisor, Professor Lewis, received a Nobel prize, but the others have received some fairly significant accolades and Prof. Malkiel certainly played a major role in creating the intellectual basis for the modern investment management industry. BTW my undergrad grades were among the highest in the department. I read your site because you bring up interesting topics that require some thought and frequently challenge accepted wisdom. You appear to primarily read comments to find fault with the commenters. That form of Trumpian debate may be popular these days, but I don’t see it as helpful in eliciting thoughtful dialogue. Your statements belie your degree. That your profs knew much doesn’t mean you know anything. Knowledge is not transmitted by contact, like rabies. We’ve been thru this too many times to bother with. But I’ll give a few corrections to your comment. Like most of them, it is riddled with basic errors. Here are a few. That’s a common claim by right-wing faux economics. There are ample private sources confirming BLS estimates of inflation (eg., MIT’s Billion price project). Also, long-term underestimation of inflation would mean that real GDP growth was much smaller than reported — which is contraindicated by many other metrics of US economic activity. As explained in Econ 101, the National Income and Product Accounts system consists of multiple interelating measurements – many of which also have equivalents measurements from non-govt agencies. It’s probably impossible to fraudulently tweak it over a long period of time. Even inadvertent calculation errors would soon become obvious. Doing so would require silent cooperation from thousands of government employees over several generations (i.e., they would know of any long-term inaccuracies, whether fraudulent or inadvertent). Doing so would create internal inconsistencies in the NIPA data. Doing so would create inconsistencies with non-BLS data from govt and non-govt data (eg, sales, profits, transportation activity, payrolls, incomes, taxes). (b) Supply and demand has often created negative real interest rates — and sometimes negative nominal rates. Nominal market rates on bank deposits were often negative in the 19th century, as highly secure banks charged to hold your money (eg, as did the ancestor of Citicorp). (3) Your relentless focus on the past (and conservative faux economics, who have declared inflation and hyperinflation so many times since early 2008) ignores how conditions have changed. It’s possible that massive inflation is no longer a feasible way to substantially reduce government debt. See the details here (it’s all standard macroeconomics). What are the limitations of the Fed’s power? It’s neither impotent nor omnipotent. You do not appear to have understood much of what you say you have read. The propaganda you have absorbed, despite Princeton’s best efforts, is a living demonstration why a relentless focus on the facts is our only way to a better future. You seldom contribute to thoughtful dialog in economics. You post false material. I point out how that conflicts with known data or basic economic theory. You ignore my comments and post more falsehoods. This is the typical practice of right-wingers. Sometimes I have continued the dialog past any sensible point – and they return to and repeat their original debunked falsehood. Those on the Left prefer to make up stuff, attribute it to their foes, and give devastating rebuttals to that imaginary argument. Watching the two clash in debates about US politics is like watching two windmills clash. Each spins in the wind, unconnect to anything but the breeze. I suggest you review your understanding of the Federal Reserve. The Open Market Committee controls monetary policy, but a large percentage of Fed employees directly regulate the largest banks in the country and have the ability to directly affect their ability to create credit and conduct other business operations. The Fed dramatically changed the nature of banking when it began paying interest in reserves and purchasing assets beyond its previous mandate of focusing almost only upon liquid treasury securities. The primary purpose of these activities was to prevent the credit markets from working (i.e. collapsing) in the aftermath of the 2008 crash. Since 2008 there has been a dramatic increase in the liquid reserves to loans ratio in the U.S. https://data.worldbank.org/indicator/FD.RES.LIQU.AS.ZS?locations=US&view=chart and a similar increase has occurred globally https://data.worldbank.org/indicator/FD.RES.LIQU.AS.ZS?view=chart. Since that time there has been a precipitous drop in the velocity of money to levels far below the prior experience in our adult lifetimes https://fred.stlouisfed.org/series/M2V. I believe that the combined effect has been to dramatically reduce the ability of the banking system to create credit. This had had the effect of neutralizing the monetization impact of federal deficits and other debt creation activities, dampening both inflation and private economic activity. I stick by my belief that there is a tremendous reservoir of inflation built into the system that has been reflected in cascading asset bubbles ranging from New York and London real estate to Bitcoin. These changes have coincided with increased inequality of income and control of wealth, further dampening the ability of the average citizen to push up aggregate demand, which would have otherwise have been reflected in significant increases in reported price levels. As a result my best guess is that, when the levee breaks, the flood of inflation will be quite dramatic. How will this happen? The next time we have a financial markets crisis, the Fed will not support a wipeout of dollar denominated asset values as would occur in an unfettered market. It will have no choice but to pump liquidity in the system. If it doesn’t the politicians will take charge and do it for them. Certainly I could be wrong; time will tell, but I do not accept your simplistic explanation that the markets control everything. We haven’t lived in a free market economy for some time. That’s why I said “You seldom contribute to thoughtful dialog in economics.” My rebuttal said “Central banks control only the riskless overnight rate. Longer-term rates are set by the market.” You reply with a lecture about the Fed’s regulatory mechanisms — which have little effect on interest rates. Enough. I’m moderating your comments. Your comments making up stuff and repeating faux economics will no longer be posted. Comments citing actual experts will go thru, if relevant to the post. Because companies are more interested in shareholder value i.e. stock performance instead of long term corporate performance they will not address the wage issue. Just look at Sears here in Canada or ToysRUs in the u.s. But the piper is coming to be paid. According to PewResearch 10,000 americans retire every day, 300,000 a month or All of MIAMI retires on mass each month. For the next two decades. Across the board: unskilled, semi skilled, professionals, entrepeneurs. Immigration tends to be the lower skilled. Already we are seeing companies slowing operating hours, not taking on new projects because of reluctance to pay the wages for the needed labour. Eventually they will need to decide: this quarter’s results or next year’s production. Yes, the Boomers’ retirement will create turmoil. But the higher rates of college education in the following generations – plus skilled immigrants — will fill much of the gap. But more important, the next industrial revolution appears to be beginning. It becomes increasingly likely that this will destroy large numbers of jobs at all levels. If so, unemployment rather worker shortages will be the problem. See my posts about this. We’re about ten years (perhaps less) from automation replacing the need for OTR drivers. Moving to driverless for trucks, which primarily travel on interstates, is far easier than for passenger vehicles primarily traversing city streets. Driver shortage solved soon! This is often given as a reason people don’t want to become truckers. I’m skeptical, but it is possible. First time comment for me. Since the conversation involves the trucking industry I felt I should share my experience. I have been driving trucks for 40 years. The problems with the trucking industry do mirror the problems with so many other industries in the United States. First of all, (at the risk of sounding cliche) many of the younger generations seemingly lack the work ethic that older generations have. Many young people I meet just don’t like the idea of having to work for a living. I can remember when truck driving was a “fun” job. Those days are long gone. I wish I had a dollar for every time I have heard the comment “all you do is drive!” The public has such a huge misconception about trucking. The volume of traffic on the roads combined with the ignorant and (literally) malicious behavior of so many people in their cars has made driving a truck one of the most stressful jobs there is. You cannot let your guard down for a moment. Wages in the trucking industry mirror the picture that we see across the board in the United States. Stagnant. The money I make now driving a truck is the same as I made in the mid 80’s. A good friend of mine works for a large trucking company and a few months ago the CEO of that company was quoted as saying “there is no good reason why a truck driver should make $80k a year.” This despite the fact that my friend and his coworkers work 6 days a week, 70 hours a week with only 30 hours off in between. Over regulation. I’m not aware of many other professions that have the level of regulations required to operate a CMV. I remember some years ago David Letterman doing a bit on his show when the government was looking for a new defense secretary. His joke was that if they could find a candidate who can pass the CDL written test they will have found the perfect person. Immigration? At least 10 years ago I noticed a large influx of Slavic truck drivers. Same old story. Cheap labor. Immigrants willing to work long hours for substandard pay. Many of them unable to read or speak English, yet entrusted with the responsibility of piloting a big truck down the road. American corporations with the full knowledge and assistance of the United States government, have been actively recruiting immigrants to come here and take the jobs for decades. Yet the American public is so uniformed and so easily manipulated. On the subject of automated trucks, I don’t believe that it will ever happen. The same old “technology is the answer to all our problems” marketing that the mainstream media does so well. Usually on behalf of the corporations that have a vested interest in that technology. You only need to look at the all the recent news stories about Tesla’s automated cars to see where that idea is heading. Same technology will be used in automated trucks. I could be wrong though. In America the safety of the public has never taken priority over profits. Wait until that first incident when an 80,000 pound automated rocket steamrolls a tour bus full of senior citizens on their way to the casino. Thank you for sharing your first-person experience. It’s always useful to hear from people on the front lines. There are 5 levels of autonomous driving. The Tesla tech is level 2 (partial automation). It has been recklessly misrepresented by Tesla as Level 3. Or 4. Real self-driving systems — with Lidar sensors and better software — will do much better. The first airplanes were crude and dangerous. In a decade they were in routine (albeit limited) commercial use. People almost always overestimate short-term tech progress, but underestimate long-term progress. Simple intermediate step for automated OTR. Limit them to interstates, turning the roads into a new form or railroad, which effectively they already are. Build terminals at strategic locations outside metros. Use local shorthaul to deliver the containers to end locations. That’s logical. On the other hand, my guess is that the tech will advance far too fast for such regulation. More likely, different limitations will be required for different levels of autonomous vehicles. What’s appropriate for a Level 5 systems won’t work for Level 3. Well Larry, and John, I understand the (mistaken) idea that technology is the answer to all our woes. That idea is embedded in our brains at a very early age. Automated trucks will only (maybe) solve the problem from a corporate standpoint. What will become of the tens of thousands of people who presently make a living driving trucks? Will more immigrants be hired to work in those new distribution centers? I find it interesting that the conversation is usually first from the standpoint of profits and efficiency. Rarely about the greater good. Rarely about what is best for people. Maybe I have become more compassionate in my old age. In my lifetime I have not seen many technologies created that have not created several problems of their own. Hence the deception. Maybe if we approached our problems from a human standpoint first we would be better off. Keith, Larry likely has gotten to understand me will enough to know that I was being ironic when I said that technology would “solve” the driver crisis. Since you are new to the dialogue, I owed you better. I live in Memphis. Our two largest job categories are truck driver and warehouseman. Each of those job categories are going to be dramatically impacted by technology over the next decade. I have great concern as to what that means for the citizens of our community and have tried to raise the awareness of that predictable crisis among the local leadership with little success. Ah, I see. As you say, John, being new to the conversation I didn’t understand. You know, we have to attempt as best we can to think outside the walls set up by the system to constrain our thoughts and conversations. If we don’t, our conversations remain nothing but that. Conversations. Not to be confused with solutions. I am convinced that most of the world’s problems are a result of a universal lack of compassion. “It doesn’t affect me, so who cares?” In a profit motivated system true people oriented solutions become impossible. It is human nature. Profit is the single biggest constraint placed upon change or solutions. I know religion is not a popular subject. Personally I find the Bible very interesting. In the Apostle Paul’s letter to Timothy ( 1 Timothy 6:10) the Apostle writes: “For the love of money is root of every evil.” There is no truer statement. I grew up in an era where profit and social responsibility were not considered mutually exclusive. All the Boomers did. The change away from that is part of the Right’s successful roll-back of America to before the New Deal. The Left has allowed that, just as the Right has allowed the Left’s massive reconfiguration of American society. Both movements have now crushed all opposition. It is the pursuit phase, where victorious forces chase a fleeing beaten foe. What makes our situation more pitiful is our whining and dreams of the Great Day When the Walls Will Tumble and the Righteous Rise. Dreamtime for proles. My guess – guess! — is that opposition forces will arise to these movements. But the moderates have been destroyed in the cross-fire between Left and Right. Any powerful new forces rising will be extreme. Perhaps very extreme. Interesting article if anyone is interested. “Hiding the Real Number of Unemployed” by PETE DOLACK at Counterpunch. That is propaganda, negative knowledge – designed to mislead you. A very apt cite to a post about fake economic news. I’ll point out just a few, although almost every paragraph is misleading. Every president takes credit for good economic news. With rough justice, since Dolack and his fellow partisans would immediately blame Trump if the rate was rising. There is nothing in the following text to support this statement. He never defines “happy days.” There are some indications that the US is approaching full employment, which is as good at it gets. Perhaps Dolack’s standard of “happy days” is Heaven. OK, but you have to die to get there. This is a staple of Right-wing and Left-wing propagandists, their similar methods showing that they are cousins under the skin. There is no “real” number for unemployment, or inflation, or GDP, etc. These are concepts, not terms defined by God. Which is why the US government shows them using multiple definitions, from narrow to broad. Neither of those is an indication of how many people are working. Both are rates, not a level, despite Dolack’s dancing. The measure of the number of people working is the number of people working. Again, there are defs from broad (everybody with any paid employment) to narrow (full-time in non-farm jobs). This is false on multiple levels. Keynesian economics did not “breakdown”. The labor force participation rate changes due to many factors, some good and some bad. Since the 1970s access to disability income has risen, more people are going to college, more people getting advanced degrees, and more people retiring. The latter is important and will become more so: earlier retirement and an aging population (the 1970 date Dolack cites was the low point – 28, it is 38 now).